I was born in Buffalo, NY, and grew up in Hamburg — a quasi-suburban environment. We were the dead-end on a dead-end street lined with Ozzie-and-Harriet homes. But our three-story, redbrick Colonial opened up in the back to this wondrous 40 acres. We had horses, chickens, pigs, sheep (which we kept in the basement at times), a monkey (briefly) and a raccoon. It was a total menagerie. My parents live there to this day. My parents first lived in Boston and had seven kids when my father took a job at the university in Buffalo. The story goes that my mom was so depressed, she said she needed a project to take her mind off the move. Why raising seven kids didn’t qualify as a project, I don’t know. Anyway, I was born shortly after they moved, and <<I>> became her project. We were highly informal, but in a way, also quite rigid. We went to bed at a certain time; we did our chores at a certain time. Every kid in my family played a brass instrument, belonged to the 4-H Club, and went to an elite college. No one rebelled — or even thought about it. We did what we were told to do, and we were all high-achievers. It was expected of us, and I’m forever thankful that it was. Both of my parents were physicians. My dad stopped seeing patients at age 92. He was originally a rheumatologist, but he moved more into academic medicine as chairman of the Department of Medicine at SUNY Buffalo. My mom was a general practitioner at a mental hospital. When the mental hospital was reconfigured into a prison, she became a prison doctor. She is a tough lady. My dad studiously avoided being home for dinner. Whichever of us kids drew the short straw would have our dinner late and eat with him. We’d talk about his day at the Department of Medicine, and then we’d talk about our day in school. After dinner, he’d go back to work, transcribing until 11 o’clock at night. Of the nine children, I am the only one who is a sports fan. I fell in with a group of kids in the neighborhood who loved sports, and — living in Buffalo — we’d play street hockey and football. It became my identity, and I started thinking about sports all the time. I fell in love with Buffalo’s pro teams and became an avid fan. I also fell in love with reading the sports page every day in <<The Buffalo News>> and the <<Buffalo Courier-Express>>. If I misbehaved, my punishment was that I wasn’t allowed to read the sports pages. It was around that time that I first started thinking about wanting to grow up to be the guy in the newspaper who wrote about sports and had his picture at the top of the column. I wanted his job. I went to Harvard College and was editor-in-chief for the school’s paper, <<The Harvard Independent>>. One summer, I had a Time Life internship, and another summer, I worked for the <<The Miami Herald>>. So I thought about journalism, but I also started thinking, "Respectable people don’t write about sports for a living." Like many college students, I started taking myself too seriously and wondering in what ways I would change the world. At some point, the idea of becoming a sportswriter seemed like something only a 12-year-old would say. It was like saying I wanted to be a cowboy or an astronaut. Being a sportswriter was not something that people really grew up to do. So after I graduated with a degree in history from Harvard College in 1983, I went to Australia for a year on a Rotary scholarship. While I was there, I started thinking about all my friends back home accomplishing great things. I told myself, "What the heck. Everybody says you can do anything with a law degree," so I applied to two law schools. I liked Harvard Law School just fine, but I knew fairly early that I didn’t actually want to be a lawyer. I kept at it for a bit and did some clerking before working as an associate for two years at Hogan & Hartson in Washington, DC. But I was never truly happy doing that work. It just wasn’t working for me. It was 1991, and I was now 30 years old. I finally took a leave of absence and took a chance. I enrolled at Columbia University’s School of Journalism. I didn’t know if that was the right step; I only knew that being a lawyer wasn’t. I graduated from Columbia with my master’s in 1992. I applied to every newspaper I could find, and the only job I was offered was working for <<The Anniston Star>> in Alabama, making $225 a week covering high school sports for 10 weeks in the summer. That was the best offer I received. I grabbed it. I loved the job from the start. I didn’t know if I could live on the salary, but I loved the job. My career progressed pretty quickly after that, and I never looked back. Four years after that beginning, <<The Commercial Appeal>> offered me a job to take the place of Al Dunning, who had been the paper’s sports editor for 18 years. I moved to Memphis in 1996, and I’ve been writing sports for the <<C.A.>> ever since. It has been an incredible 17-year period for sports here: AutoZone Park was built; we had the John Calipari era and the DeAngelo Williams era; the Mike Tyson fight was huge; both golf and tennis tournaments continued growing; the Grizzlies came to town; FedExForum was built — just to name a few. For the city, it has been a great stretch, and for me, it’s been a wildly entertaining and rewarding time to cover. The perks of being a sports columnist include … The main perk is that the essence of the job is to go find the most interesting story you can find, talk to the most interesting people involved in it, and write about it. That’s the perk. The average number of sporting events I attend per week … depends on the month, on the season. I’ve attended nine different events in one day before — at the London Olympics — but in Memphis, I probably hit two or three a week. The public’s biggest misperception about being a sports columnist ... is that we’re fans of one team or another. People constantly say things like, "Ron Higgins went to LSU, and therefore he pulls for that team." Nonsense. We don’t care much about the game results, and we don’t pull for the teams. We pull for early deadlines and great stories. The biggest challenge with this job ... It’s an erratic schedule. I work every weekend, and I work nights. I am working when everyone else is playing. But it’s a tremendous job, both from a creative perspective and from a being-a-single-dad perspective. I have a lot of freedom. My least favorite part of the job ... The administrative work. I’m horrible at it! But I like everything else I do — the reporting, the writing. There’s very rarely a moment that I don’t enjoy. The topics I cover are determined by … me. I pretty much have total freedom to choose what I cover, but it’s fairly obvious what events I should be covering. I’m "supposed" to write three to four columns per week — as events dictate. So I write whenever something happens. One of my biggest mistakes ... I wrote that the Grizzlies shouldn’t trade for Zach Randolph. I’m supposed to be an expert on the Tigers, the Grizzlies, and every sports group and sports-related topic in Memphis. I wrote about where they should build FedExForum; I wrote about <<whether>> they should build FedExForum; I wrote about whether they should build AutoZone Park Downtown or in the suburbs. Things come up, and you have to be an instant expert on everything. And you know what? I’m not. The commenters on <<The Commercial Appeal>> website … are, for the most part, an incredibly mean-spirited bunch, unfortunately. But what I’ve come to learn is that they do not represent the majority at all. By and large, people seem to appreciate what I do. They come up to me in the grocery store, in church — the responses are overwhelmingly positive, and it’s an incredible privilege that people care about my opinions. One commandment a sports columnist should never break ... No cheering in the press box is the obvious one. I would also add not starting a question with the words, "Talk about …". My biggest pet peeve … is when people take mindless, easy shots at Memphis. The worst injury I incurred covering sports … Basketballs will come flying over our table, and my laptop has gotten smashed, but that’s about the worst so far — unless you count a bruised ego from time to time. The spelling of my first name … I’m the eighth of nine kids, so it’s possible my parents ran out of names. I have no idea how they came up with Geoff. We Geoffs are an exclusive bunch: there’s Geoffrey Chaucer; Geoff Bodine, the NASCAR driver; and Geoff, the Toys "R" Us giraffe. Those are the Geoffs I refer people to when they invariably pronounce my name "gee-off." One of the funniest things that happened ... The Grizzlies were off to a bad start one year, and they had had a really bad start the previous year. I wrote, "If they exceed last year’s losing streak, I’ll play Christmas carols in front of the FedExForum on my tuba." The day they broke the record, they were playing the Golden State Warriors. The coach of the Warriors distributed my column to his players before the game. The players made comments from the court, such as, "That guy had better go warm up his tuba!" And indeed, I had to play Christmas carols in front of the FedExForum on my tuba. I got some ringers to help me, though, including the tuba player from the Memphis Symphony Orchestra. My favorite sport to watch … I don’t have a favorite. I grew up with football and hockey, so I probably plug into those the most easily. But if there is a great story on, say, speed skating or curling, that’s where I want to be. My most embarrassing moment in print ... Botching a name spelling is always mortifying. When I hit a writer’s block, I … I don’t have time for them! I’ve got to write columns. Sometimes the game ends and I have 14 minutes to write a column. The perfect example was when the Memphis Tigers lost the national championship game. They were on track to win that game with a few minutes to go, and I had a whole column written about them finally bringing a title back to Memphis. Stunningly, they lost. There was no time for writer’s block; I had to write a column fast. And some columns will be lousy ones, but at times, you just have to hit the "send" button anyway because it’s 11 o’clock and your deadline has arrived. 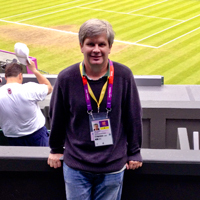 Being a sportswriter has taken me to … U.S. Open golf tournaments, the Masters, 12 Super Bowls, the World Series, and seven Olympics. All of that is great fun, but to be honest, at this point I’m more interested in writing about all things Memphis. What I love most about my job ... I’m out, I’m talking to people, I’m learning their life stories, and I’m writing. My first thought the first time I was named Best Sports Columnist in the country by the Associated Press Sports Editors … "It’s not a Pulitzer, but it’s not bad." The sports celebrity who wows me most … I’m always impressed by athletes who have not been twisted by the cult of celebrity. I’m wowed by any athlete who says my name when he talks to me and who is actually interested in me as a person — any athlete who is self-aware enough to figure out that the world is not 100 percent about them. The locker room … Typically, the drill is: the game ends; you go talk to the coach first and get his comments; then you go talk to the players in the locker room. I suppose it could be awkward, but it’s what we’re used to. One of the drawbacks to being a sportswriter … I don’t mind when I’m at a party and people <<want>> to talk about sports — if they are really interested in sports. That’s great; that’s fine. Sometimes, however, people think that the <<only>> thing I can talk about is sports! I can talk about a wide variety of other topics, too! My father taught me … the importance of enthusiasm in whatever you choose to do and that your work should be your pleasure and vice versa. Also, that each of us is supposed to make a contribution to the world. You’re not put here just to have fun; you’re put here to have fun while making a contribution. The traits I got from my father … Dad is a great talker and is curious about everything. Whenever we went somewhere, he’d talk to people about why this and how that. I inherited those traits. Curiosity is a prerequisite to being a good reporter. If you’re not interested in the arc of people’s lives, their stories, and what makes them tick, you’re not going to be a decent journalist. My family was a <<very>> verbal one, and in a way, I’ve made a living with that. My mother taught me … She likes everyone. She finds dignity in every human being and welcomes everyone. She befriends everyone, including the cook who makes her dog’s hamburgers at McDonald’s. The traits I got from my mother … The "small-D" democratic approach toward life. Also, her love of animals. I have four chickens and a dog at home. Mom didn’t have any fashion sense because she didn’t care about fashion. "Substance matters more than style," she’d say. I got that trait, too. My children … Ben is 15, Andrew is 12, and Peter is 10. Ben loves sports; Andrew and Peter could give a flip. The difference between children today and when I grew up … We tend to coddle our children more. For example, I know that two of my kids like spaghetti, but the third one doesn’t want the noodles and sauce to be mixed. So when I make the spaghetti, I put his sauce on the side. But when I was growing up — with eight siblings — there was no room for that kind of individuality. Mom said, "Here’s what’s for dinner, and you will eat it." Taking care of our childhood animals taught me … that it’s not all just about me. The animals required care — and it often superseded what we wanted to do. My first paying job … I had an egg route and newspaper route. Later, I worked at the Erie County Fair for 4-H, and I checked in the animals that were coming to the show. I’m not very good at … fixing anything. I am totally undone when my smoke alarm starts beeping at me because the battery is low. One time when I couldn’t get it to stop beeping, I wrapped it in a sweater, put it in a cooler, and set the cooler outside. That is the level of my incompetence. When I’m not being Mr. Sports Columnist, I am ... Mr. Dad. My three sons live with me every other week, and on the off-week, we get together for things like tennis lessons and church. The hardest part about covering the Olympics … The whole event is just grueling in the sense that you’re working 18-hour days and it’s just go, go, go. There are no moments to relax for lunch or enjoy the nightlife. The routine is that when you wake up, you look at which events are planned, and then you race all over the place. And in real life, the Olympics are spread out over hundreds of miles, so it seems like you’re always in the wrong place and there’s nothing you can do about it. For example, I might be covering the speed skating event while 100 miles away on the top of a mountain, the U.S. ski-jump team is sweeping the medals. You’re always racing to make the distance while beating the clock. That said, I’ve covered seven Olympics, and each has been wonderfully fun. The Gary Parrish Show … gives people a chance to think of me as a three-dimensional person. They can hear my personality. I’m only on for 15 minutes a day during the two-hour show, but people can also tell that although I love sports, I can talk about a lot of other things — like my chickens, one time! Most people don’t know that I ... had leukemia as a kid. Back in the day, most folks who got leukemia died. As a result of my having it and surviving it, it became my role to be the mascot of the family. And part of the mascot’s role is to make people laugh and make them happy. As I get older, I realize ... that the Buffalo Bills may really never win a Super Bowl in my lifetime. My final 2 cents ... One of the great privileges of living in Memphis is that if you have something to offer this city, you will be embraced for it. It’s not like San Francisco or New York, where people go there for everything they can get out of it. One of the great things about Memphis is that you actually can make a difference in the trajectory of this place. There are a lot of communities where that is not necessarily true.